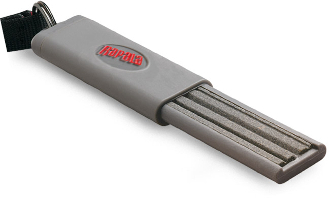 RAPALA HOOK SHARPENER Keep your hooks at the top of their game with Rapala's true grit, aluminum oxide stone sharpener. A neck lanyard and retractable design make this tool easy to use and easy to store. Restores points in seconds.